We have seen this process played out on the big screens in movies, in our own lives and the lives of others. The reluctant hero gets the call to adventure from within or outside forces and that starts the refusal to take the call. In the movies that refusal is overcome and the journey starts, it would be a short movie if the refusal won! In our own lives the journey does not always start straight away and sometimes never. For those who do start the journey into the unknown getting as far as the trials or abyss can send them running back to the known. So it would seem that the key is getting past the abyss as nothing will be the same again after we pass this point and the journey will complete in some way. In my opinion we can break this down into 3 things we need to overcome and if we can solve these then the journey will complete. 1. If we can formulate a plan for getting past the abyss then we will take the call to adventure again and again in the future with confidence and expectation of completing the journey. In fact we will no longer find ourselves reluctant to take the call but instead looking forward to the next journey. So by overcoming 2 and 3 before we start we will have overcome problem 1. 2. The road of trials can be an unwelcoming place if we arrive there alone. Our journey could be weight loss, relationships or maybe business building they all share common threads and will always encounter trials. This is where a plan of action, mentor, desire, etc. will be called upon. Napoleon Hill and many others have given us the tools for this, we just need to use them. Each and everyone of us has the ability to overcome trials as long as we truly believe in the journey we have started and it is in line with our beliefs and authentic selves. Strength in numbers is essential here as a group of like minds are always going to be greater than the sum of their parts. 3. Passing the Abyss will require us to finally let go of our old self and embrace the new. So as before the journey has to be in line with our authentic selves and not a whim or exercise to please others. Death and Rebirth seem a little harsh in this box but in a way we are letting our old self die to make room for the new us. If we cling onto our old self then we can never complete the journey. The popular weight loss journey could be used as an example here. If we still see ourselves as an overweight person who has lost a few pounds then we will inevitably regain the weight. If we truly become a different weight in our head and accept the new reality as our future we will instinctively keep up the exercise and make healthy choices with food. Being continually on a diet is not completing the journey, it is keeping someone else in business but you have not returned to the known world much different from how you left it. This can be applied to self help gurus in all areas of life, if they are not helping you formulate the tools to complete the journey then they may be helping themselves more than you. This is just my opinion and I’m sure you will form yours about the Hero’s Journey. It makes a great plot line for a film or book but I’m more interested in relating it to my life and those with whom I have the pleasure to meet and work with. We can all be a hero if we wish to and that is a fantastic thing! 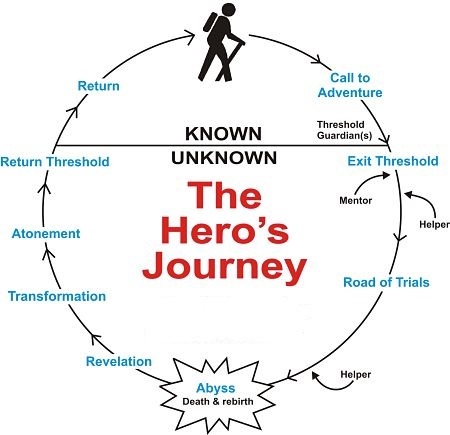 This entry was posted in MKMMA 2015 - 2016 and tagged Heros Journey, master key, Success on January 30, 2016 by Steve Earl. I agree, be the hero of your own story!